It’s been a gorgeous Christmas break and I have been loving the warmer days and sunshine. With such perfect weather, it has been a lovely opportunity to enjoy some beach days which I had really missed - I hadn’t realised that it has actually been some years since I have hit our beautiful sandy shores! I used to be a HUGE fan of hot summer days spent on the beach. Years ago, at the first hint of a warm day I would be out there soaking up the sun, working on my bronze. It really was the accepted norm then. But the more we know now about the risk of skin cancer, as well as the effects of the sun on our skin and ageing, the more it has deterred me to be out unnecessarily in the heat. Moreover, I know also look to celebrate a fair complexion as it generally means that my skin has been protected from the sun’s rays and hopefully I am removing one less external factor that can speed up my natural ageing process. SHOULD YOU MISS OUT ON THE AUSSIE SUNSHINE AND LIFESTYLE? By no means should we be completely sun avoidant as there are definitely benefits to being outdoors and having safe sun exposure. The health benefits are for being active and keeping moving, rather than sedentary at home. Physical activity is great for our mood and can help our sleep. Vitamin D from sunshine is also needed for our bone strength to help our bodies absorb calcium and phosphorous to prevent brittle bones. There are also links to particular cancers and potential immune system deficiencies in persons with low vitamin D levels. So we cannot be completely sunshine free without getting our vitamin D from elsewhere. Too much sun exposure, can be damaging to our bodies-particularly to our skin and our skin health. It really is one of the biggest accelerators of ageing and in my years of practice, I have really seen the difference in skin qualities in patients who have had reasonable sun exposure compared to someone of a similar age who has spent considerably less hours in the sun. WHAT IS THE SCIENCE BEHIND THE SUN’S IMPACT? We basically have 2 groups of factors that can influence how our skin ages. These are Intrinsic or Extrinsic. Intrinsic Ageing we have little control over. It pre-determines how fast your body is affected by the degenerating effects of free radicals and the ability of your body to repair itself perfectly. Your genetics pretty much decides how fast your biological clock is going to tick. Natural ageing is a process that starts in our mid 20’s and the internal changes affect our muscles, fat and skin. So we may not actually see some of the early effects of ageing until years down the track. Extrinsic Ageing on the other hand, we can have some input over and exercise a little preventative caution. These are lifestyle and environmental factors that will speed up your natural ageing process. Common ones are sun exposure (UV light), smoking, air pollution, chronic stress and excessive alcohol consumption. Specifically to facial lines and wrinkles, factors like sleep position, how frequently we use of muscles of facial expression, diet and gravity can also play a part. Of these factors, sun exposure is quite clearly leading the way for the main cause of premature skin ageing (photoageing). WHAT HAPPENS BEYOND SKIN DEEP? In Australia we have a high level of ultraviolet radiation (UV). Even with just a few minutes of UV exposure on a daily basis, over a number of years, results in changes in our skin. Over time, this contributes to photoageing. UV radiation in sunlight damages the collagen and elastin fibres in the skin – two of the key elements we don’t want to lose in our skin. A large proportion of our non-surgical aesthetic treatments are working on the basis of trying to regenerate or delay the loss of collagen and elastin. These are the 2 ingredients in our skin that we need to keep it firm, tight and glowing. The problem is, we may not see the effects of sun damage in our younger years. By the time we see the effects visibly on our skin, it usually means that there is reasonable damage beneath the surface. Clinical filters with medical imaging can show up just how much impact UV radiation has had before we can see it with the naked eye. Initially, you may start to notice drier skin, early fine lines and wrinkles and a loss of skin glow. Over time though, lines and wrinkles become more obvious and coarse, skin is rough and has a leathery texture, is generally more loose and freckles, age spots and a generally blotchy more yellow complexion is noted. You may also start to get spider veins, thicker crusty patches of skin (actinic keratoses) and worse case, skin cancers. I am sometimes surprised that even during wrinkle relaxer injection treatments, a younger patient can have skin that seems a little “tougher” when I am injecting. And almost always, when I ask if they spend more time in the sun or are exposed due to work conditions or similar, the answer is almost always yes. This observation may be anecdotal but it makes sense that the skin has become thicker with increased sun damage as later on we see the effects of leathery, sallow, pigmented and blemished skin. I think gone are the days where tanned skin is what is considered beautiful. More and more we seem to be wanting porcelain-like, clear, pigment and freckle free skin. And almost every patient I consult wants to look younger and fresher than their biological age. WHAT OPTIONS DO WE HAVE TO SLOW DOWN PHOTOAGEING? The answer still remains the same – that prevention is key and sunscreen is a must. When it comes to sunscreen, there are so many options on the market and you wouldn’t be the only one if you had wondered what the differences in SPF ratings were or whether it mattered whether UVA or UVB protection was included or if there really is a difference between brands and types of sunscreens. We can break it down a little to have a clearer understanding. Ultraviolet Radiation (UV) is part of the light spectrum from the sun, that reaches us. We cannot see UV radiation with the naked eye because it has wavelengths that are shorter than visible light. UVA and UVB itself refer to different wavelengths of light. 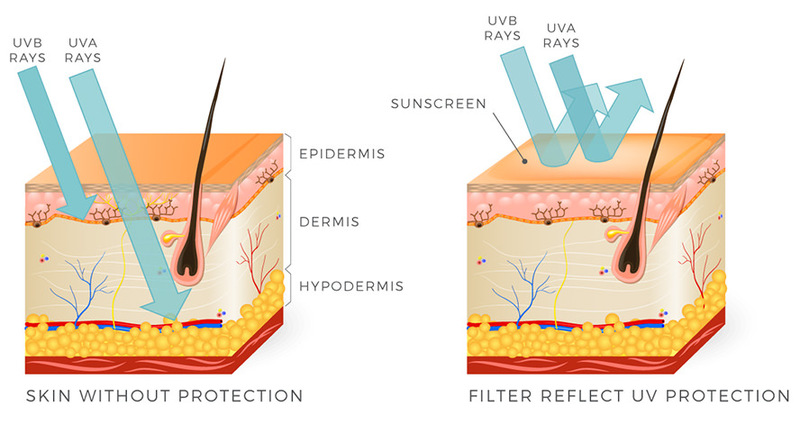 UVA is the longest wavelength and UVB is the shortest which means they penetrate our skin at different depths. Some years ago, it was thought that we didn’t really need protection for UVA rays since it didn’t damage the layer of our skin closest to the surface where most skin cancers arise. But over the last couple of decades, there has been more evidence showing that damaged skin cells in our deeper skin layers are where skin cancers occur. UVA is also responsible for changing our skin colour and giving us our skin tan. It also actually penetrates through glass! And we now know that when it comes to tanning, it isn’t just our skin darkening but you achieve a tan because an injury to our skin’s DNA has occurred. Not only does this add to skin ageing but more importantly, can lead to skin cancer. UVA is also generally what tanning booths emit from their sun lamps so this form of tanning is not really considered safe either. UVB on the other hand, reaches your outermost, most superficial skin layers and is responsible for delayed tanning and sunburn to your skin. It is certainly a culprit in photoageing as well as the development of skin cancer. UVB rays are generally stronger in summer and at specific times of the day but they can damage and burn your skin at any time of the year. Sun Protection Factor (SPF) we have heard of and most of us have SPF 15+ ingrained as the minimal protection level but what does it all mean and what is the difference between a SPF 15+ and SPF 50+? SPF is basically a way of measuring how well a sunscreen can prevent UVB from damaging your skin. It is not so much about how much protection a particular SPF number gives you but more so the length of time of protection. If you were to apply an SPF 15 sunscreen to your face and body – in general this means that the sunscreen will give you 15 times longer protection. So if it normally takes about 10 minutes for your skin to pink up in the sun, the SPF 15 will give you up to 2.5 hours before your skin reddens. How does this compare to the higher rated SPF’s? An SPF 15 sunscreen will filter out about 93% of the UVB rays that you are exposed to. An SPF 30 will block out about 97% and an SPF 50, closer to 98%. Sounds like a minimal difference? If you have a history of skin cancer or are light-sensitive, the extra percentage of protection can make a difference. But the key is to realise that no sunscreen gives you 100% protection. Sunscreens work in two ways – by absorbing UV radiation or by scattering the harmful rays to help prevent them from reaching your skin. Sunscreens that scatter radiation are generally known as Physical Sunscreens and have ingredients such as Titanium Oxide or Zinc Oxide. Sunscreens that absorb UV radiation are generally referred to as Chemical Sunscreens and have common ingredients such as Oxybenzone, Octocrylene, 4-Methylbenzylidence camphor (tongue twister!) and Butyl ethoxy dibenzoylmethane. Broad Spectrum refers to the fact that the product aims to protect you against both UVA and UVB radiation. Is one type of sunscreen better than another? I don’t think we can claim for certain that one is better than another and what you choose should be dependent on how much sun exposure you are anticipating – is it just for less than 10 minutes on your walk to and from work, or do you spend hours outdoors due to your work or lifestyle commitments? Water-resistant options may also be better of course if you are out in the water but also if you play outdoor sports or do quite physical activity in the heat. My advice for choosing a sunscreen would be to try and get as high an SPF rating as possible and ensure that UVA and UVB protection (broad spectrum) is possible and even better that there is some water resistance but there is a trade off for this as the sunscreen tends to be a little thicker and may not sit as well under makeup. I lean more towards a physical sunscreen personally but essentially you need to choose a sunscreen that you don’t mind the feel of on your face and that gives you a look and finish that you are happy with – otherwise you are less likely to apply it religiously. What we really need to realise is that no sunscreen gives us 100% protection for the harmful rays of the sun. As well as this, despite the SPF ratings, we should reapply at least every 2 hours as protection cannot be guaranteed beyond this time. And sunscreen needs to be on at least 20 minutes before we step outdoors, even on a cloudy day. How much do I need? Is another common question. The Cancer Council recommends for an adult, 1 teaspoon for the face and 1 teaspoon for each arm, leg, your chest and abdomen and back – a total of 7 teaspoons for your face and body. In addition, if you can add a hat, sunglasses, long sleeves or even just seeking shade, these will help to improve your sun protection further. WHAT IF I ALREADY SEE CHANGES FROM PHOTOAGEING? It’s still not too late to exercise prevention to avoid worsening of your skin and also for ongoing protection against skin cancers. Your options then will depend on the severity of your photoageing and the amount of down time (redness and peeling) that you are willing to have. Treatments generally involve a Hydrating component to help repair your skin barrier, depigmenting and something that resurfaces the skin. So for all us sun lovers – we can all still enjoy the sunshine but in moderation and with the best protection we can possibly provide. Let’s start to celebrate the fair, blemish free complexion and feel confident in our natural shade – your skin will thank you in years to come.